The two factories located in the cities of Chennai and Nellikuppam in the State of Tamil Nadu manufacture gums and candies. 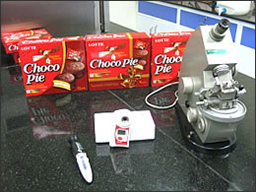 We visited the Chennai factory that just started producing the "Choco Pie," a very popular Korean treat similar to the Oreo and Moon Pie cookies, in 2010. The facility is very big with an extensive lawn that provides an open feel. Mr. Ramkumar and Mr. Ravi Shankar gave us a tour. They visited Lotte of Korea many times to learn about the production. Their favorite Korean food is bibimbap. What are you measuring with the refractometers? We are measuring the concentrations of glucose and sorbitol used in the "Choco Pie." Which models of refractometers are you using? We are using the NAR-3T, PALs, and MASTERs in the QC lab. We are also using several hand-helds for batch testing at the production line. ATAGO is honored to be part of Lotte's efforts to be "Asia No. 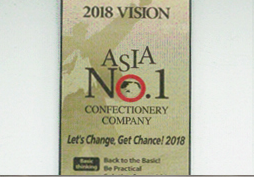 1 Confectionery Company." 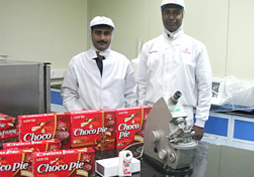 A gelatin-free version of the "Choco Pie" was developed for the Indian market with a large vegetarian population. 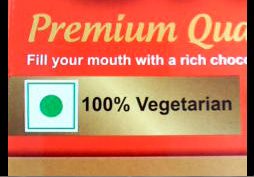 The green circle in a square indicates that the product is vegetarian-safe. Thank you for accepting our visit at such a busy time of the year, before Diwali, and also for the "Choco Pie" souvenir. We enjoyed it! 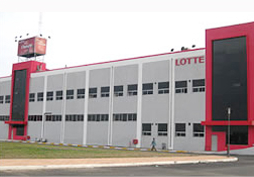 We are looking forward to Lotte's first TV commercial in India. It is exciting news.